Provides access to leading Canadian contract cases. Expert commentary and analysis focuses on recent developments in the law and on how courts have treated and interpreted contracts as a whole. This is a student edition. 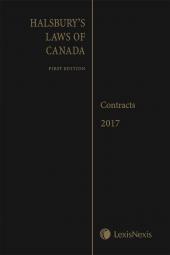 Click here for the professional edition of Canadian Contract Law, 4th Edition. 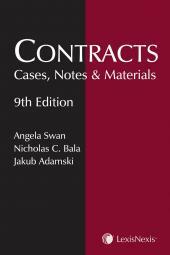 With the immense number of contracts cases out there today, busy practitioners need a practical, in-depth contracts text book that tells them what the important cases are, why they are important, and what the underlying principles are. This book fills that need. 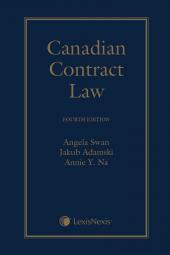 Written by Angela Swan, Jakub Adamski and Annie Na who are equally at home in academia and the legal practice, Canadian Contract Law, 4th Edition helps lawyers advise clients, draft agreements, and recognize the pitfalls and dangers in resolving contract disputes by carefully explaining the actual approach courts have taken to solving contractual disputes. All aspects of contract law are covered, so lawyers need not look elsewhere for an authoritative interpretation and practical guidance on Canadian contract law. How do the rules deal with this problem? What other consequences and solutions may exist that the courts have not yet explored? Angela Swan, B.Comm., LL.B., B.C.L., is Counsel and a member of the Corporate/Commercial Group and the Corporate Finance Group at Aird & Berlis LLP in Toronto. She is also an Adjunct Professor at Osgoode Hall Law School of York University. She was a Professor of Law at the Faculty of Law, University of Toronto from 1965 to 1988 and at McGill University from 1996 to 2002. She has also been a sessional lecturer at Queen's University and a Visiting Professor at the University of Victoria. She was previously a partner at Aird & Berlis LLP. Her areas of expertise include contract law, corporate law, and the conflict of laws. Martindale-Hubbell has granted her an AV rating signifying the highest level of legal ability as well as an extremely high adherence to the professional standards of conduct, ethics, reliability, and diligence. She is co-author, with Nicholas C. Bala and Jakub Adamski, of LexisNexis Canada's Contracts: Cases, Notes & Materials, now in its ninth edition. With Jakub Adamski and Annie Na, she is co-author of Canadian Contract Law, Fourth Edition. Jakub Adamski, B.A., B.C.L., LL.B., LL.M., is a lawyer who advises on litigation and corporate law disputes. He previously worked at a leading Toronto law firm after completing his legal education at McGill University and Columbia Law School. He has maintained a strong interest in legal education by lecturing on corporate and securities law at the Faculty of Law, McGill University and on sale of goods, contract law and the legal profession at the Université de Montréal. With Angela Swan and Annie Na, he is co-author of Canadian Contract Law, Forth Edition. He also authored the Legal Profession title for Halsbury's Laws of Canada, and has authored several articles, case comments and presentations. Annie Y. Na, B.A., M.A., Ph. D., J.D. has a Ph.D. in linguistics from the University of Chicago and a J.D. from the University of Toronto. She was called to the Bar in Ontario in 1999 and was a research lawyer in Fraser Milner Casgrain (now Dentons) LLP and Lenczner Slaght Royce Smith Griffin LLP. Since July 2016, she has had her own legal research practice. She has published articles on a variety of legal subjects.With Angela Swan and Jakub Adamski,, she is co-author of Canadian Contract Law, Forth Edition.